It's been a while, but let's move on.. Recently, (and thankfully) my skin has been getting clearer by the day, meaning I have more time to experiment with other areas of my makeup, rather than concentrating on getting my base perfect every morning. I've opted for the YSL Youth Liberator Serum foundation in the lighest shade. I bought this last year, but hadn't been able to really test it out properly as it gives quite light (but buildable) coverage, and I'd needed something a little more heavy duty. I find I only need a tiny pump of this, and I buff it into my skin using the Zoeva Silk Finish brush. I then use a dab of NARS Radiant Creamy Concealer in 'Chantilly' on any areas which need a little more coverage. I set my base with a very light dusting of MAC's Mineralise Skinfinish in 'Light', and a bit of 'Lightscapade' across the top of my cheeks as a highlight. Next up, my favourite discovery this year - Benefit's blush/highlight 'Dandelion'. This beautiful powder gives a subtle glow to the skin, along with a pinch of colour. It's the perfect thing to brighten up my pale cheeks. I quickly run Soap & Glory Archery brow pencil in 'Blondeshell' through my brows, before lining my upper lash line with L'Oreal Superliner in Black, and adding a small flick. I've been using this eyeliner for years and years, and I've yet to find one that does a better job, or lasts as long. I finish by coating my lashes with Benefit's Roller Lash mascara (Note: definitely worth the hype), and popping a bit of Clarins Instant Light Lip Balm Perfector in '03 My Pink' on my lips. This balm moisturises so well, and this particular colour comes out slightly different on everybody. On me, its a beautiful subtle mid pink. I'm keen to try the others in this range! I hope you enjoyed this post, I'm glad to be back! Yay for more clearer skin ^___^ keep it clear and healthy! Yay you're back :D! A great first post to come back on too. The Mac skin finish is gorgeous. Serious product envy right now. 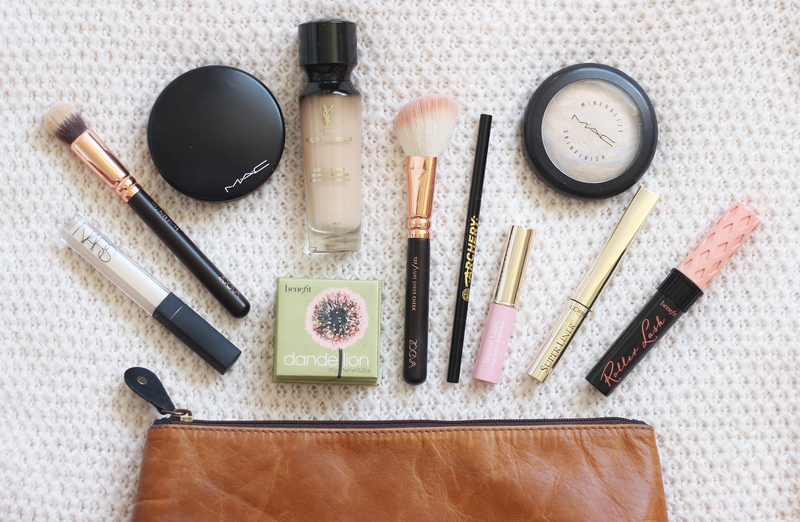 This is the most beautiful looking make up bag I have ever had the pleasure of looking into! There isn't actually one thing that isn't either still on my wishlist, or I've already got! Your make up game is stroooooong giiirl! The Clarins Lip Balm Perfectors are so easy to wear, I absolutely love them! I was after Lightscapade last week but sadly it was out of stock, I may have to hunt it down online.